Earthquakes in Oklahoma and Kansas had been on the rise due to injection of wastewater—a byproduct of oil and gas operations—before regulations started limiting injections. Now a new model developed by Stanford University researchers incorporates earthquake physics and the Earth's hydrogeologic response to wastewater injection to forecast a decrease in man-made earthquakes in Oklahoma and Kansas through 2020. "We've created a detailed model that allows regulators to know where most of the problems are likely to occur," said co-author Mark Zoback, the Benjamin M. Page Professor of Geophysics at Stanford's School of Earth, Energy & Environmental Sciences (Stanford Earth). "This can be used in Oklahoma, or elsewhere, to provide a scientific basis for regulatory action." The same pressure increase in different areas can cause up to 100 times the number of earthquakes, according to lead author Cornelius Langenbruch, a postdoctoral researcher at Stanford Earth. The earthquakes are not necessarily concentrated in areas where the pressure change is highest. In order to understand where earthquakes will or will not occur on a local scale, the new model evaluates the pressure increase in the context of the area's vulnerable, pre-existing faults. "It was surprising for me to see that the local susceptibility to earthquakes fluctuates by such a large amount," Langenbruch said. 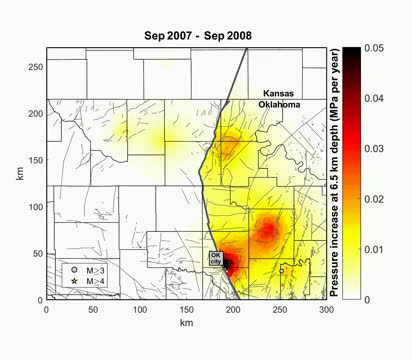 "The example of Oklahoma shows that the key to managing seismic hazards related to these man-made, induced earthquakes is managing how much and where the wastewater is injected." Oklahoma's induced earthquakes increased drastically around 2009 and peaked in 2015, with nearly 1,000 widely felt earthquakes spread across the northern and central parts of the state. Oklahoma's public utilities commission, the Oklahoma Corporation Commission, mandated a 40 percent water injection reduction in early 2016 and the number of earthquakes declined thereafter. 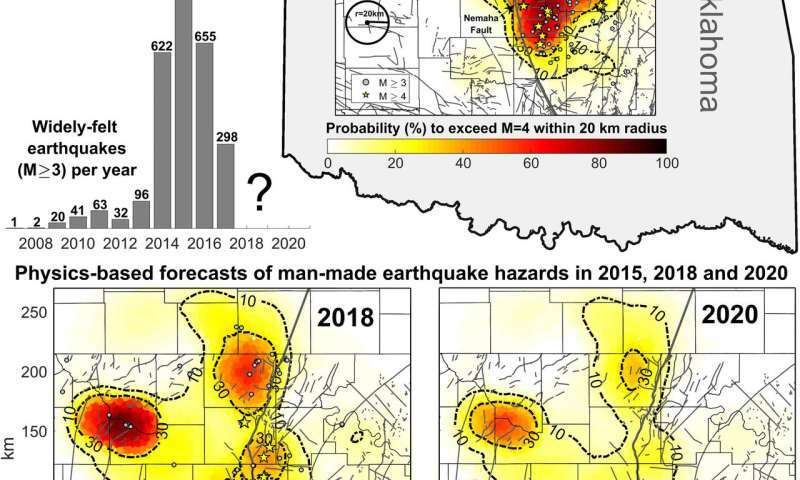 The new model—which includes data from 809 injection wells from 2000 through 2018—shows there will be a 32 percent, 24 percent and 19 percent probability of potentially damaging earthquakes of magnitude 5.0 or above in 2018, 2019 and 2020, respectively, suggesting that Oklahoma's policies are working. If current injection practices in north-central Oklahoma and southern Kansas continue, one potentially damaging magnitude 5.0 or larger earthquake is expected to occur through 2020. "The result of the new study is definitely good news—it shows injection rate reductions are still effective. In 2015 and 2016 the probabilities were as high as 70 percent," Langenbruch said. "However, the problem is that earthquake probabilities in some areas are still much higher than historic rates." "The nice thing about the methodology is not only the predictions it makes, but its ability to make new predictions based on new measures that might be taken by the regulators," Zoback said. "It turns out you can do these analyses fairly early in the process." A co-author of the paper is Matthew Weingarten, an assistant professor at San Diego State University who conducted research for the study as a postdoctoral researcher at Stanford. Zoback is also a senior fellow at Stanford's Precourt Institute for Energy, an affiliate of the Stanford Woods Institute for the Environment and the director of the Stanford Natural Gas Initiative. Funding for the study was provided by the Stanford Center for Induced and Triggered Seismicity (SCITS), an industrial affiliates program involving 10 Stanford professors.